Luxury in the everyday is a cinch with these chic-yet-comfortable boots. Made from only the very best sheepskin and leather, Australian UGG boots are a cult favourite for a reason. Look to them for comfort that works on the street as well as in the house. These now-famous shoes were born on the beaches of Southern California, with which founder Brian Smith fell in love. Founded in 1978 with a great amount of hope and a love of sheepskin, UGG had becomer a symbol of cool Cali style by the mid 1980’s. Surf shops in particular proved popular epicentres for the UGG movement. Soon, bigger cities and towns caught onto the trend, and the boots moved from summer wardrobes to winter ones, too. By the new millennium, a move towards more casual wardrobes proved useful for the furthering of this brand’s popularity. In 2000, the boots featured on Oprah’s Favourite Things, propelling the shoes into super stardom. 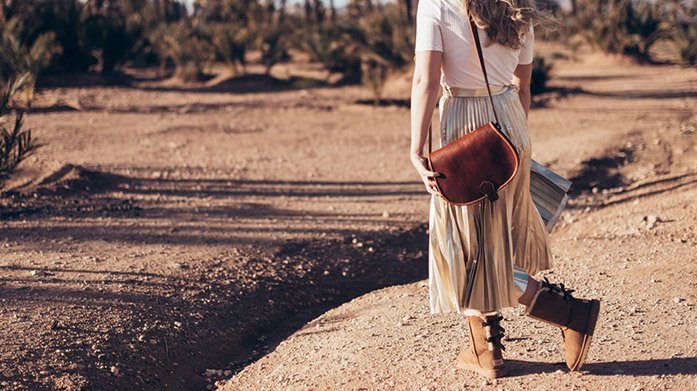 Now selling slippers, clogs and sandals as well as the classic sheepskin boots, UGG has come to characterise the active, outdoor lifestyle that it encourages, as well, of course, as simply lounging around the house. Enjoy your own UGG boots (or sandals, or clogs) for less today at BrandAlley.